Allison and Joe’s summer wedding. Bright, colorful and cheery are the words that come to mind when we think about Allison and Joe’s summer wedding! It was a gorgeous day for the outdoor ceremony at Bridges of Poplar Creek Country Club, with the reception at Venuti’s Banquets. 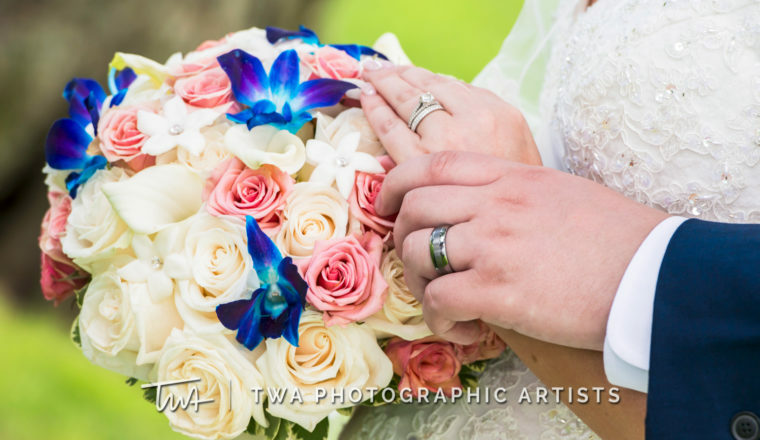 Allison’s bouquet featured ivory roses, white calla lilies, coral spray roses, blue dendro orchids and stephanotis with crystal pins. Her bridesmaids, as well as her ceremony and reception flowers, were a mix of light blue hydrangeas, coral spray roses, coral gerbera daisies, green mums and blue dendro orchids. Thank you to Timothy Whaley & Associates for the images!